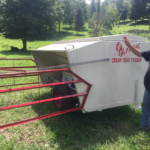 David Noland, a Jackson County Cow/Calf producer, received a 2018 “WNC AgOptions” grant to help with his cattle business. David needed to separate his heifers from their offspring during feeding time for greater effectiveness to increase weight gain on his calves. In order to diversify and expand their cattle production, David like most other cow/calf producers in our area needed a way to make greater profit by selling heavier and healthier calves. One such way is to allow the calves to eat unobstructed by the larger heifers since the heifers are to big to get into the feed bays of the creep feeder. One of the best pieces of equipment to use for “Creep Self Feeding” is the “Apache Creep/Self Feeder,” which is a factory built creep feeder and allows calves to eat grain at will restricting bovines access to the feed. This creep feeder is on wheels, which allows it to be moved to cleaner healthier ground and to different locations as needed. This calves are weaned at about 6 months of age. Weaning is very stressful for a calf often causing the calf to lose valuable pounds and then become stressed and susceptible to sickness. Having calves on creep feed 80 days prior to this crucial time offsets the loss of weight and supplements due to the reduction of the mother’s milk to ensure all of the calf’s energy and feed requirement are met. Creep feeding can add an additional 100 pounds to a calf by the time it is sold and also adapt quicker to feedlot rations. This was grant was attained by producer securing a “WNC AgOptions” grant for $3,000 with the support of the local N.C. Cooperative Extension office and the NC Tobacco Trust Fund. For more information on “Creep Self Feeding” please contact Kendra Norton at the N.C. Cooperative Extension, Jackson or Swain County Center at 586-4009 or 488-3848. • Is Creep Feeding Calves Cost Effective?